Madison, Wisconsin. 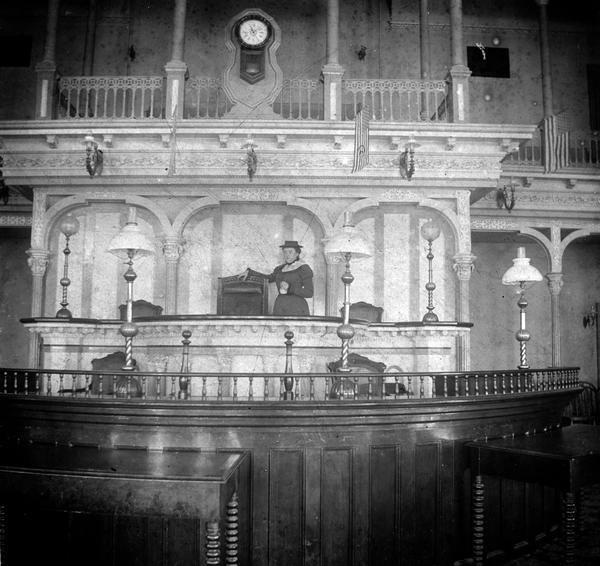 Assembly Chamber in which Levi Havemann completed decorative carving in the late 1850s. German-born Levi Havemann (1824-1905) came to Madison in 1854 as a skilled wood carver and cabinet maker. He crafted the hand carved pedestal table featured here, along with most of the decorative carving in the senate and assembly chambers during the construction of the second State Capitol in the late 1850s. Later, he made the cabinet for the taxidermied "Old Abe," the eagle that had served as the mascot for the 8th Regiment of the Wisconsin Volunteer Infantry during the Civil War. The cabinet and the stuffed eagle were lost in the 1904 Capitol fire. Havemann lived at several locations around Madison including a home on Gorham Street near today's James Madison Park. According to family history, Havemann harvested wood from that land to make this table.